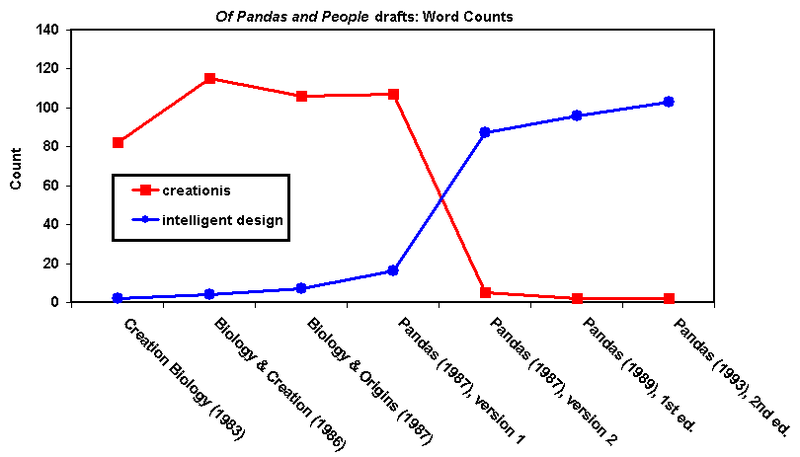 You might be interested to read about a very rare transitional fossil between creationism and “intelligent design” that was recently discovered by Barbara Forrest during her exploration of some exhibits filed in Kitzmiller v. Dover, namely drafts of the original “intelligent design” book Of Pandas and People. The amazing beast, “cdesign proponentsists” was discovered directly above strata containing the well-known and ubiquitous species “creationists”. Previous research by Forrest had dated the layer the missing link was found in to the latter half of 1987. …but, as is often the case in punctuated equilibria between closely-related species, the transitional form has a small, geographically localized population, and so is difficult to discover in the fossil record. Through painstaking sifting through the record, however, Forrest eventually found the holy grail: a perfect intermediate. Both creationists and Intelligent Design proponents were quick to point out that the discovery had created two new gaps between the two movements.